An innocent elderly man was assaulted, kidnapped, and falsely charged. The cop who did the abusing was just paid $50/hour for two years of not working. 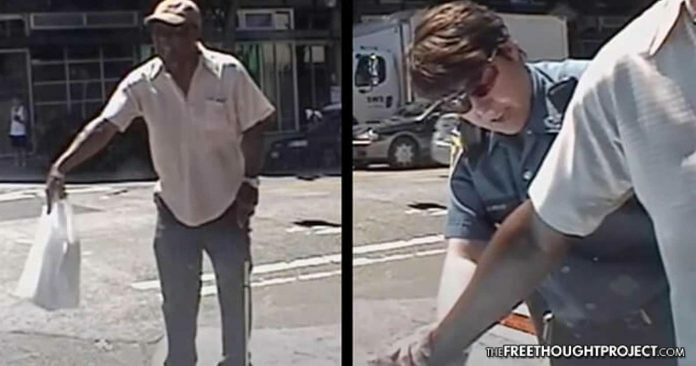 Seattle, WA — An overzealous cop was fired in 2015 after the officer was caught falsely accusing a 69-year-old man of swinging a golf club at her patrol car. Accused by the police chief of acting with racial bias in an unnecessarily aggressive manner, Officer Cynthia Whitlatch wrongfully arrested an Air Force veteran walking down the street using a golf club as a cane. Although Whitlatch argued that her dash cam video recorded the elderly man swinging at her, the video does not support any of her allegations. Now, two years later, this cop is having her termination reversed and receiving two years of back pay. The back pay is more than $105,000 in two lump payments, paying her for 90 hours a month for the time since she was fired. All sustained findings by the Office of Professional Accountability about Whitlatch’s conduct will remain in place. The agreement, signed Saturday by Police Chief Kathleen O’Toole, also is expected to give Whitlatch her full pension for her 18 years as an officer and the two additional years after her firing. As Whitlatch continues ordering him to put down the golf club, Wingate tells her to call someone because he’s been walking in Seattle with that golf club for 20 years. After she informs Wingate that he’s being audio and videotaped, the apparently delusional officer accuses the elderly gentleman of swinging his golf club at her. “I ain’t done nothing to nobody,” Wingate explains to her. “I did not!” Wingate defended. “Yes, you did. Right back there. It was on audio and videotape,” Whitlatch lied. As Officer Chris Cole approaches the scene, Whitlatch can briefly be seen brandishing a nightstick while following Wingate. After the frightened senior hands over his golf club, Whitlatch digs through his pockets but finds nothing illegal. The rest of the video depicts Wingate being loaded into the back of a transport van and sent to jail for committing no crime. Falsely accused of swinging his golf club at a patrol car, Wingate spent over 25 hours in jail after being booked for obstruction and harassment. Although Whitlatch pushed the Seattle City Attorney’s Office to charge the elderly veteran with obstructing a police officer, an assistant city attorney declined to charge him with obstruction but decided instead to charge Wingate with unlawful use of a weapon to intimidate. Unable to afford decent legal representation, Wingate pleaded guilty to the misdemeanor charge under an agreement in which the case would be expunged after two years if he complied with all conditions ordered by the judge. But after reviewing the dash cam footage, the Seattle City Attorney’s Office dismissed the charge, and the police chief formally apologized to Wingate nearly eight months after his arrest. After the dash cam video was released to the public in January of 2015, Mayor Ed Murray ordered Whitlatch to be removed from public patrol duties. In a disciplinary action report filed last year, Police Chief Kathleen O’Toole accused Whitlatch of being inappropriately aggressive while unnecessarily escalating the situation. In April of 2015, Wingate filed a lawsuit against Whitlatch for race discrimination, false imprisonment, intentional infliction of emotional distress, and violation of his civil rights. His lawsuit also accused her of making racially derogatory comments on her personal Facebook page after Wingate’s arrest and the Ferguson riots. In her report, Chief O’Toole noted that Whitlatch also made disturbing comments about the race of a judge and deputy chief involved in expunging Wingate’s criminal record related to his wrongful arrest.